Are you fed up with the unnecessary programs on your computer and still confused what to delete and what to keep. 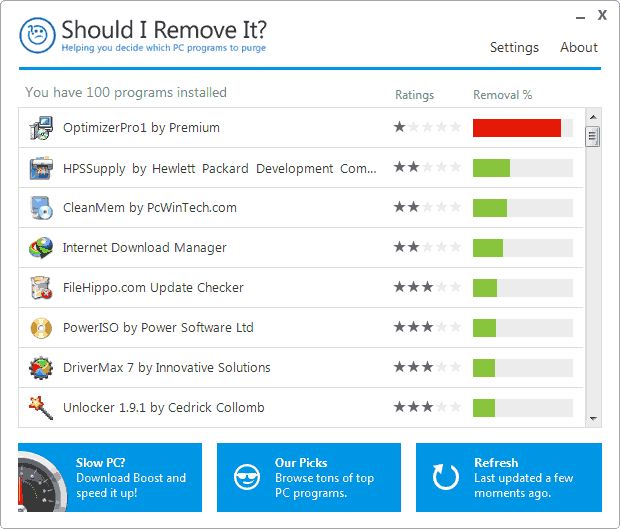 Here comes a new application known as “Should I Remove It?”, that can help you to decide what programs you should keep and which one to uninstall. Most of the free applications today install unnecessary toolbars and programs in addition to the main application, which then slows down our system. But with this free app we can remove all such stuff and increase our system’s performance. This app has a great advantage that it does not automatically delete the unwanted applications installed on the system, rather it first scans the system and then suggests the user what to remove by giving the rating and the percentage of people who removed the application after installing. It works on both 32-bit and 64-bit versions of Windows XP, Windows Vista, Windows 7 and Windows 8. The application is very lightweight and consumes very little amount of RAM. Working Of Should I Remove It? First you need to download and install the application. On its first run, it analyzes the whole system and collects all the information about all the installed programs on your computer and inspect them against its own servers. 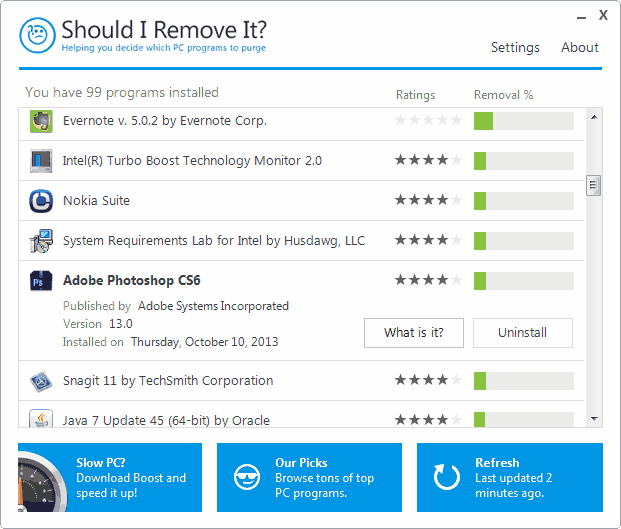 Then it displays the detailed information about all the installed applications by giving the “Rating” of the programs and the “Removal percentage“. The rating is based on based on how much the other users rate that specific application. The removal percentage depicts that how often the other users remove each of the application you have on your PC. By considering both of these values we can judge how important any software is and if other people are satisfied with that. This app can also work well without having an internet connection, but then it will display the ratings stored in its cache. When you click on any software listed by the tool, it provides you with the details of that software like the publisher, the version installed and the date on which the application was installed. In addition to this, it also gives you an option to uninstall the software and to get more information on the product by clicking the “What is it?” button. When you click on “What is it?”, it will open a new web browser window and will automatically traverse to the page which contains detailed description of that software at their own website. 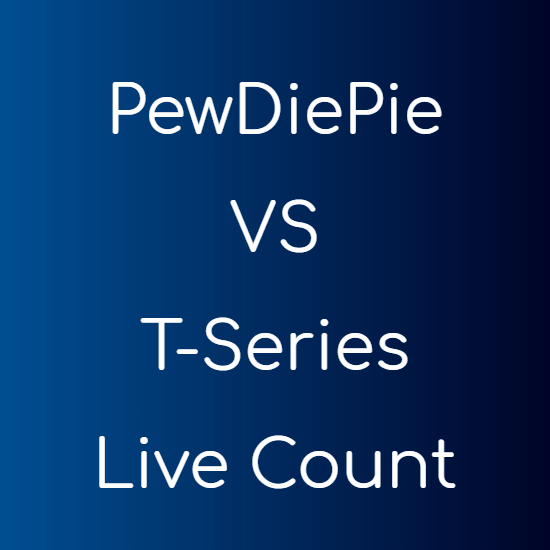 But this feature cannot work if you don’t have an internet connection, because then it will not be able to reach to its server. Sometimes Should I Remove It? will not give you the information about some products, this is because the database of “Should I Remove It?” does not have any information about that particular application. Should I Remove It? can run on a schedule too. It can automatically register itself to run every month. This can be done inside the Settings menu of the application. Should I Remove It? is a very simple and lightweight application and it does not required any intense computer knowledge. It automatically assigns the rating and makes our work easy. In the last, I will strongly recommend you to try this app and notice the change, after all, the app is available for free. LINK Should I Remove It?